It gives me great pleasure to attend the China Business Conference 2014. 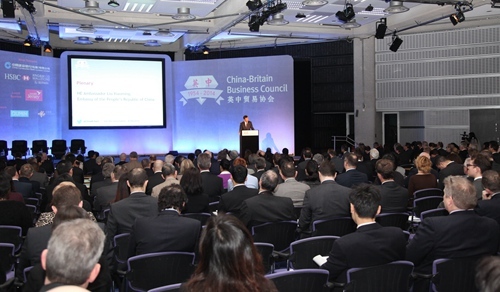 I most warmly congratulate the China-Britain Business Council for hosting this event. 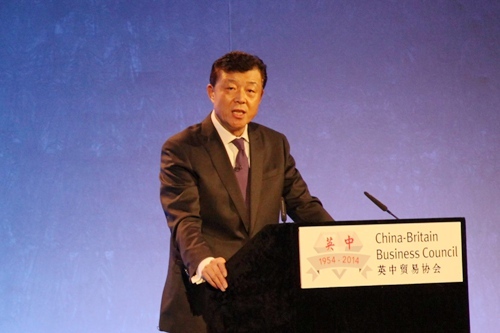 I also extend my New Year greetings to you, Chinese and British business leaders. In the outgoing 2013, like other emerging economies, the Chinese economy encountered some difficulties. In the face of mounting downward pressures, the Chinese Government has showed composure and capabilities. China has introduced a series of measures to innovate macro-regulation while maintaining policy consistency. Through cutting red tape and delegating down decisions, China is unlocking the dynamism of market forces. Since the third quarter of 2013, the Chinese economy has steadily turned a corner and regained growth. The Chinese Government is confident that China will hit the target of an annual GDP growth of 7.5%. Based on this valuable experience, a solid foundation has been established for China’s economic growth in 2014 and beyond. A headline event in China in 2013 was the Third Plenum of the 18th Central Committee of the Communist Party of China. This meeting endorsed a master plan of comprehensively deepening reform in China. The focus of this ‘blueprint’ is breaking the bottlenecks for China’s development. The aim is to achieve healthy and sustainable economic and social development. · In economic reform special efforts are needed to strike a balance between domestic and international markets. · And the need to build an open economic system. On two occasions, late last year, I gave my analysis of China’s future reforms. First at the Reform Club, and secondly at a dinner hosted by the CBBC, the 48 Group Club and the Great Britain-China Centre. l China has set out the plans and goals of reform. l China is confident it will meet these goals. l And deepening reform in China will not only be a powerhouse for China’s advance but also offer greater opportunities for China-UK economic cooperation. Bilaterally, 2013 saw China-UK relations return to normal and start a new journey with a successful visit by Prime Minister Cameron. 2013 was also marked by dynamic growth of China-UK economic cooperation. In particular our bilateral trade hit a new record. Chinese figures show that China-UK trade last year for the first time passed 70 billion US dollars. This was an increase of 11% per cent year on year and way higher than the 2.1% average growth of China-EU trade. What is worth a special mention is that last year British exports to China surged by an increase of 13.6%. More excitingly, the monthly growth rate in December hit a stunning record high of 38.1%. These China-UK achievements lead trade exchange between China and other EU members. · And retail and cultural industries. Currently, our two countries are exploring cooperation on nuclear energy and high-speed railways. The shared aim is to create flagship projects that will provide a tangible symbol of our economic cooperation. Next week, our working group on nuclear energy cooperation will hold its first meeting. In my recent speeches, I pointed out that reform plans set forth in the Third Plenum will bring ten main opportunities for China-UK economic cooperation. · And cultural and creative industries. Businesses of both countries will have the opportunities to secure an ‘early harvest’. In the spirit of this saying I hope that in 2014 pioneering entrepreneurs of both countries will seize the opportunities. Let us join hands to make 2014 a year of breakthroughs and another year of bumper harvest for our economic cooperation. I want to take this opportunity to thank the CBBC for organizing this event. It is also timely to congratulate you on your 60th anniversary. Through the past six decades you have been firm supporters of economic cooperation and friendship between China and UK. The CBBC is truly worthy of its name. Going forward, I hope the CBBC will continue to play its vital role and secure even greater achievements. According to the Chinese lunar calendar, we will meet the ‘Year of the Horse’ in about two weeks. In traditional Chinese culture the horse symbolizes hard work. I have every confidence that the ‘Year of the Horse’ will spur the CBBC and its members to work even harder! The opportunities are there for you and with hard work will come great rewards.